Cleaning a brush should not be a chore. 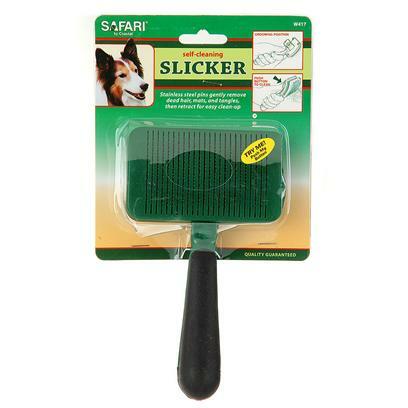 The Safari Self-Cleaning Slicker Brush's pins retract and release your pet's hair so you can wipe the pad clean all with the touch of a button. Place your hand on your pet's coat so that you don't tug the skin as you work the brush over the coat. Work slowly and in small sections. Be careful not to scrape your pet's skin or brush too vigorously. Continue brushing your pet until you've worked through the entire coat. When you've finished brushing your pet, push the button to retract the pins. Wipe the brush with a damp cloth to remove the hair. Push the button and the pins pop right back out.